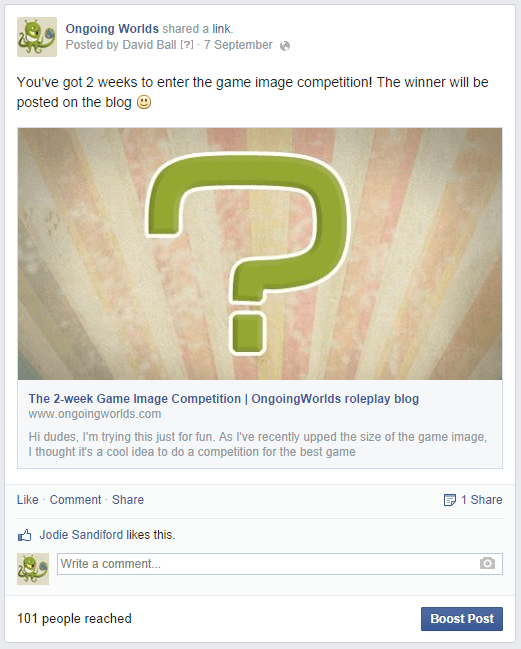 Some of you reading this have a Facebook page for your roleplaying game. Great! Facebook is a good way to get people to notice your game. But even if your page has loads of followers, your updates probably won’t get seen by all of them. This particular status update was seen by 88 people (Facebook tells you this for a page). But we actually have over 1,200 followers (I call “followers” people who’ve “liked” the page). So why isn’t it being seen by more? There’s so many updates fighting for your attention! Everything your friends post on facebook has to be shown to you, and everything companies/hobbies/bands you follow has to be shown to you too. That’s a lot of updates, and you only scroll down so far, so don’t see everything. So Facebook has to make a decision to only show you the BEST stuff. Actually I don’t mean best at all, I mean the more RELEVANT to you. If you comment on one friend’s updates more than another, Facebook will often show you their updates more than the other friend. This is exactly the same for pages that you follow. And it’s not just you that’ll see stuff like this. Facebook uses this as a metric to show the content to other people. Have you noticed lots of those Buzzfeed-type articles that are always incredibly popular? Usually really silly viral stuff. 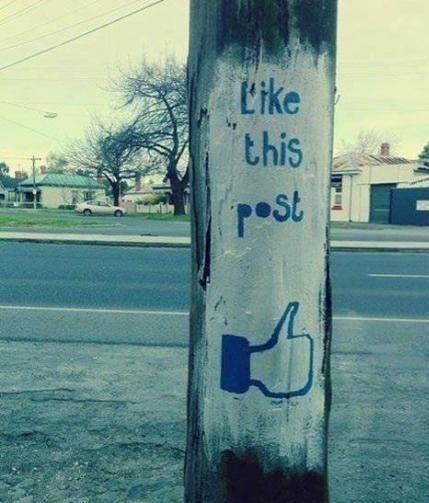 Because it’s got so many likes and shares, other people are more likely to see it. And that’s the same with all updates by a page. The more people like it, share it and comment on it, the more people it’ll be shown to. 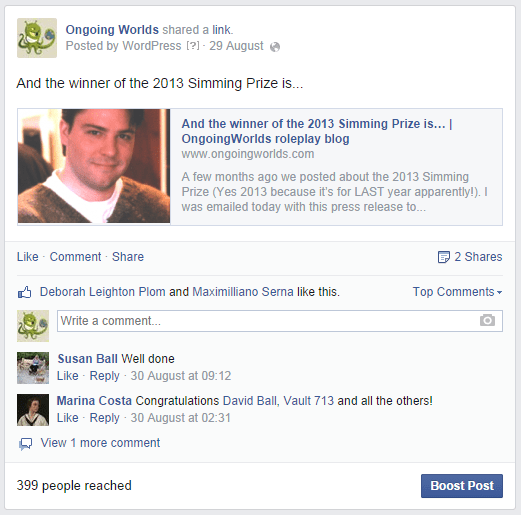 Here’s a status update that got shown to much more people – when I announced the results of the Simming Prize competition. And when I say “interest” I mean likes, shares and comments. That’s why sometimes stupid articles by tabloids get shown to more people because of people having flame wars in the comments. Because there’s loads of comments, it looks more popular so therefore is shown to even more people. Here’s an example of a status update that was posted last week. One its own it would probably only get seen by 88 people or so, just like the screenshot further up this article. But 1 person has liked it. Just 1, and it’s increased to just over 100. So thanks Jodie for liking! Clearly that really has helped. 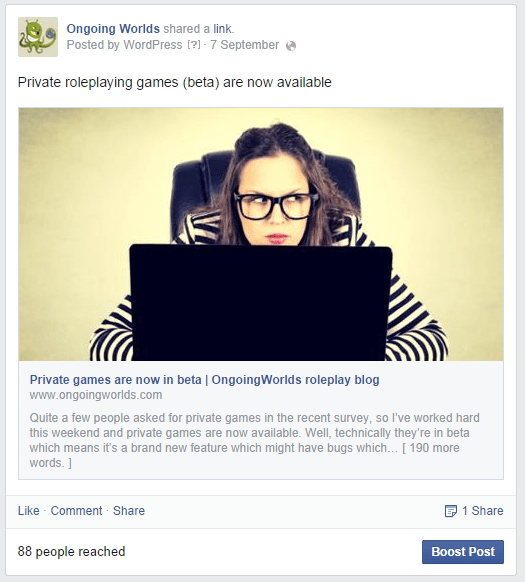 So if you’ve got a Facebook page for your roleplaying game, and you’ve struggled with people not seeing your updates – encourage your members (and as many people as you can) to like, share, and comment. we post links to our articles about roleplaying advice on our Facebook page, and we struggle just like everyone else to get people to see our content. Please if you love roleplaying, and want to help more people see our advice please like, comment and share our articles – Do it now! Announcing the winner of Flashback week!